In this guest post, Netherlands-based freelance filmmaker and editor Richard van den Boogaard tells us why he thinks a solid 10-bit 4K codec should bridge the two internal recording options in the Canon C200. During a recent Masterclass held by Canon in Amsterdam, Canon heralded the latest rendition of its successful EOS cinema line – the C200. Although widely acknowledged for probably the best auto-focus system currently out there, coupled with that magic Canon color science, 100/120 fps non-cropped slow motion and 10 stops of internal ND, this thing should sell like hot cakes, right? However, Canon apparently feels the need to up the ante in sales events. Although official sales numbers are not publicly shared, nearly a year after introduction the C200 is not doing as well as it perhaps could – or should. If anything, this is all a direct result of Canon’s own marketing strategy, more specifically the deliberate lack of 4K 10-bit 4:2:2 internal (or even external) recording. A few days ago, on March 14th, Zacuto organized a Facebook live event entitled the Camera Shootout 2018 in which ASC member Bruce Logan put the C200 through a series of tests in comparison to the Panasonic EVA1. Tim Smith from Canon accepted the challenge against Mitch Gross from Panasonic of a side-by-side comparison between the two competing platforms, although the EVA1 offers something the C200 does not. Essentially, you are comparing apples (EVA1 4K 10-bit 4:2:2) with oranges (C200 4K 8-bit 4:2:0) and mangoes (C200 4K Cineraw light). Now, I love mangoes, but they do tend to come at a cost. Initially – and as recently reported here on cinema5D – the discussion in the live feed focused on the usual shootout comparisons of contrast, gamma and detail. As Bruce Logan in the live studio concluded that “the math does not lie” referring to the difference in codecs used between the two cameras, the discussion in the chat quickly shifted on the single most-wanted issue: the lack of 4K 10-bit 4:2:2 in the C200. 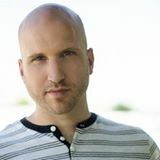 Upon being prompted by the show’s moderator, Canon’s Tim Smith initial response was something along the lines of having expected this issue to be brought up. He reiterated the official marketing response: that this codec “sounds like a good idea, but it is not on our radar at the moment”. However, after the issue kept coming up repeatedly later on in the chat, Smith seemed to concede somewhat by the end of the show. He said that although the official answer had not changed, users should keep screaming for it in the public forums, and who knows if Japan may consider it. Probably as a result of Panasonic’s announcement of the forthcoming Pre-NAB move of not only including 4K 10-bit 4:2:2 in long GOP compression in the EVA-1, but also an all-I version and external raw recording, Smith concluded: “We should have it”. For those not so well-informed, Canon uses a rather strict segmentation policy in its Cinema EOS line-up of cameras. 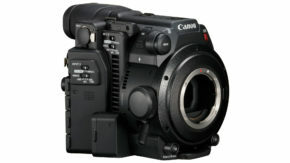 The C100 mark II was introduced in 2014 and is an entry-level 1080p camera intended for run-n-gun, after-movie and web-related work. 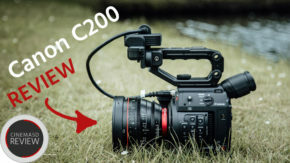 The Canon C200 – introduced in 2017 and the focus of this article – is a professional 4K camera, with anything but broadcast-specs. 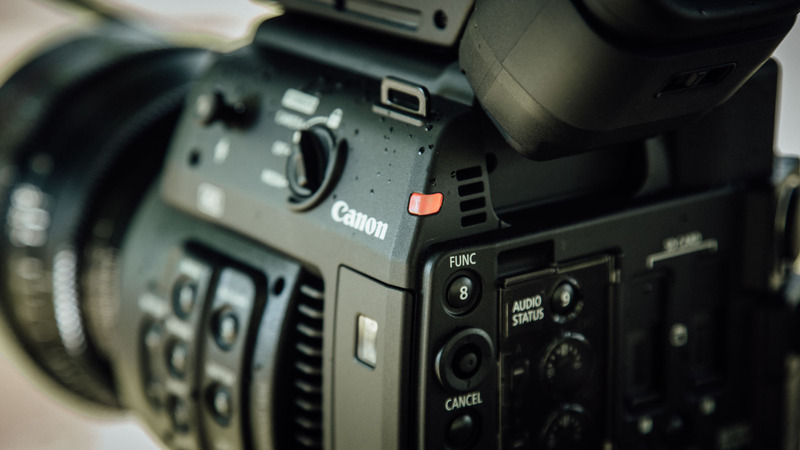 A tier higher up, the C300 Mark II introduced in 2015 is a broadcast spec 4K camera, intended for television and documentary work. 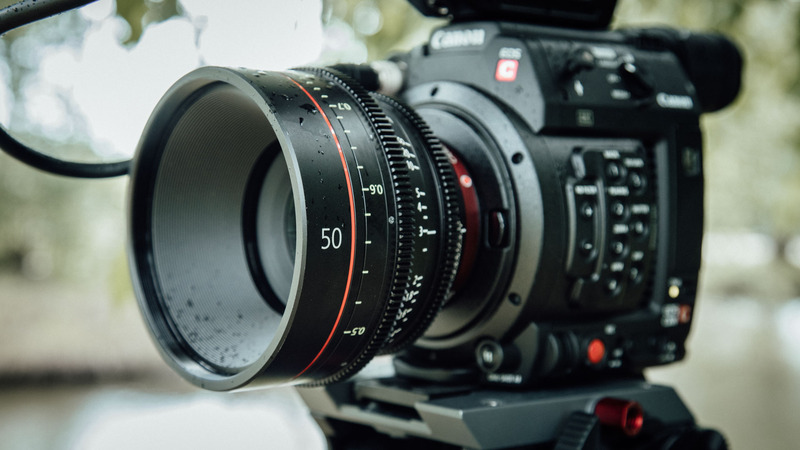 At the very top, the C700 introduced in 2016 with its 4.5K CMOS sensor is intended for feature films. The C200 is a strange beast in this line-up, in that it has both a lower-end weak 8-bit 4:2:0 codec (written to SD cards) and a data-hungry raw format called Cineraw Light (on a single internal CFast card). 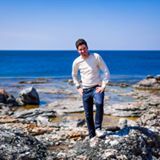 Indeed a mixed-bag, as fellow author Nino Leitner called it in his June 2017 article. You can either record small 8-bit files which are limited in terms of the grade and/or record in raw with huge data-files. 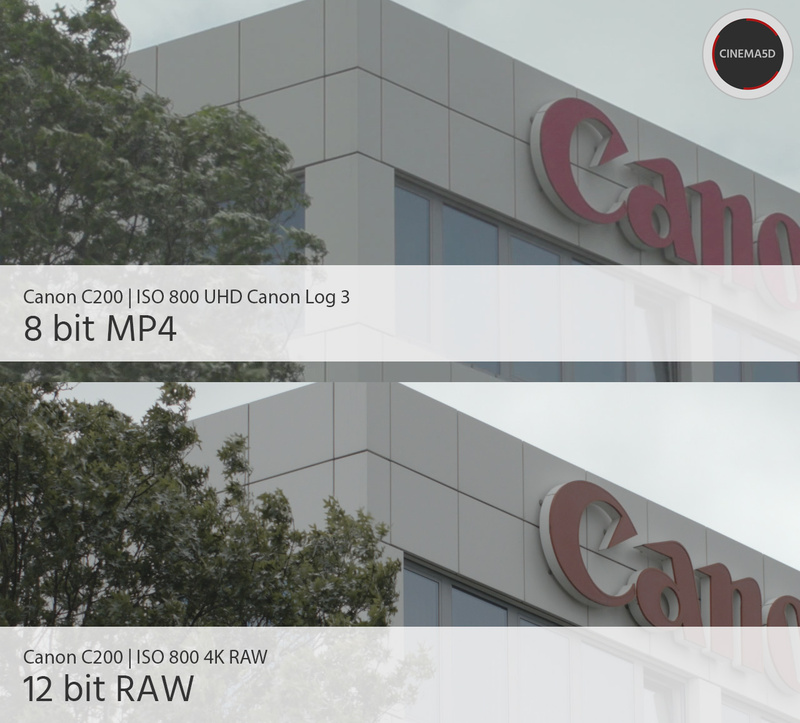 The only unofficial reason for not supporting the much-desired 4K 10-bit 4:2:2 codec in the C200 is that Canon is unwilling to be its own biggest competitor, and is mis-guided into thinking that it won’t sell any C300 IIs solely because of this choice of codec. Instead, Canon tries to deliberately blow smoke up everyone’s behinds: at trade shows and events the company’s staff state (and time and again re-iterate) that the all-new C200 DIGIC DV 6 processor is simply incapable of handling both raw recording (a 600mbit/s stream) and MP4 in 4K 10-bit 4:2:2 to SD cards simultaneously. Who says that we need to write to two codecs at the same time in any situation? Writing raw and 8-bit 1080p proxies makes sense, but once you’re comfortable with 4K 10-bit 4:2:2 as your choice of codec, you don’t need another format to go along. Also, this new processor would not be able to write 10-bit 4:2:2 in 4K to the SD cards. Strange, because the Panasonic EVA1 is perfectly capable of doing this (both in Long GOP compression and soon in All-I). How come, Canon? And even if this were true for sustained data rates to the SD cards, this camera features a wonderful CFast slot that surely must be able to handle the datastream in 4K 10-bit 4:2:2 files, right? After all, instead of the not-so-workflow-friendly Cineraw Light (reportedly 600MBit/s), writing in a much less data intensive format should not be much of a problem… especially for a processor that’s newer than the three-year old C300 II, which does feature that much-desired codec. Well guess what, Canon. 8-bit is 2008 and it’s 2018 now. I’m in the market for a new camera. I have been a loyal Canon shooter since 2009 (5D mark II, followed by other DSLRs and then C300 and later the C100). However, I am *NOT* going to invest in an 8-bit platform any longer (C100 or C200), but neither am I willing to invest in a camera that was introduced 3 years ago (C300 II) just to get a better codec – and miss out on all the new things at the same time. I like the auto-focus feature, I like the 10-stops ND, I *need* slow motion (preferably non-cropped). In fact, there is much to love about the C200. Yet, the C200 is the first EOS camera that has me seriously looking into other alternatives, such as the Panasonic EVA1. 8-bit is dead; 10-bit and better is where it’s at in filmmaking these days. 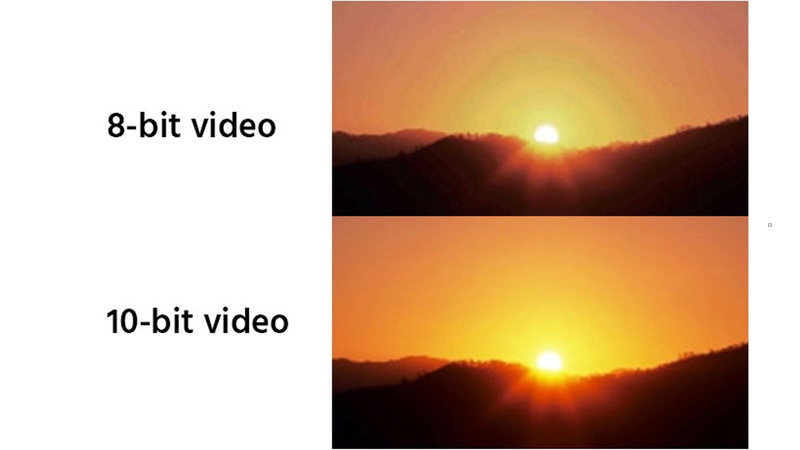 We want better pixels, not only more of them. Why do I need 4K 10-bit 4:2:2? Because, trust me, I do. Although Canon EOS cameras are perfectly capable of creating beautiful 8-bit imagery, it still is only 256 levels per color channel. I do have green screen work – work that relies heavily on VFX and footage you need to be able to quickly color correct or grade without banding issues or other nastiness. In other words, I don’t want my future camera to tell me what I can or cannot do. 8-bit is 2008, 10-bit and raw is 2018! Do I want to switch brands? No. So why, why-o-why are you forcing me, dear Canon? 4K is here to stay. Although I still have had no clients who have actively demanded 4K acquisition, I have rented in 4K cameras because it made sense for the project at hand. I hate renting. I am an owner-operator, wet-hire only. As CEOs and heads of marketing will soon start buying new 4K HDR television sets, it won’t be long before my clients start to demand 4K acquisition, and this becomes the new de facto standard, even for online work. I have dreaded my purchasing decision long enough. When upgrading your camera platform, you want to get the latest technology, not invest in something that was introduced three years ago. Should I wait for the C300 III or C400? Perhaps, but I am not willing to buy anything above $10K, given that cameras today only last 3-4 years. It just makes no financial sense for my type of business (99% online). So even though the C200 satisfies my 10-bit 4:2:2 needs with external recording in 1080p (which I kinda dislike as it constitutes another point of failure), I am not comfortable with this for 4K – for the next 3 to 4 years. Can you at least comfort me with a (paid) upgrade for 4K 10-bit 4:2:2 internal or even (sigh…) external for the C200? High Dynamic Range imaging is the next big thing. Although we have been recording with cameras that support 12 to 14 stops for a few years now, the delivery format h.264 was incapable of showing us the depth of color as it did not support anything above 8-bit (or 0-255 color levels). 4K television sets with HDR support are now quickly becoming the new standard and the uptake in 4K 10-bit h.265 delivery format neatly fits in that trend as well. However, it makes no sense if the camera you are using still defaults to 8-bit. Sure, you can choose to record everything in raw, but for 99% of my work this makes no sense at all in terms of my tried-and-tested post-production workflow. 128GB of data for, say, 15 minutes of interview footage is just insane – especially if you record with two camera angles like I do. After-movies or event work depend on fast turnaround and raw doesn’t fit in that picture. For web commercials, it’s a maybe. But 10-bit 4:2:2 in 4K is the ideal compromise. Like I stated earlier, unless you deliberately want your users to switch to another manufacturer, competition is attacking you right where it hurts the most. Panasonic made a very smart move to have an EF mount in the EVA1, meaning users will not need to buy into either a new set of lenses or have to use adapters such as Metabones that translate from one to another platform. This is what kept me from changing to a Sony FS7 a few years ago. 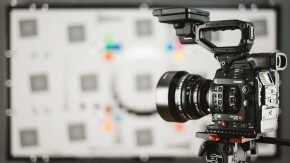 Blackmagic has done the same thing with the URSA Mini, and others (except Sony) are likely to follow suit as well. Much like external recording, I hate adding additional points-of-failure, even though they may give you an extra stop of light and wider field of view, as is the case with the Metabones Speedbooster. 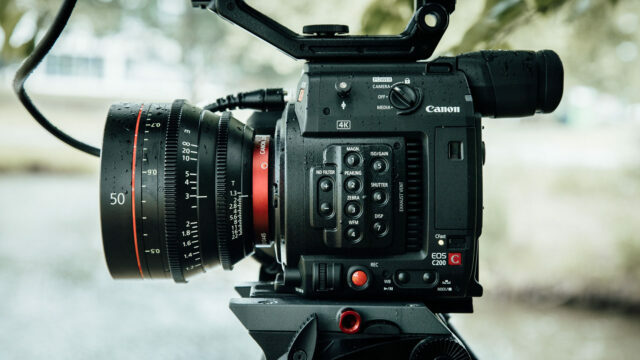 Although not officially admitted, the lack of 4K 10-bit 4:2:2 can only be attributed to Canon’s misguided marketing ploy that users who need that codec should buy the more expensive (and, more importantly, three-year old) C300 II instead. 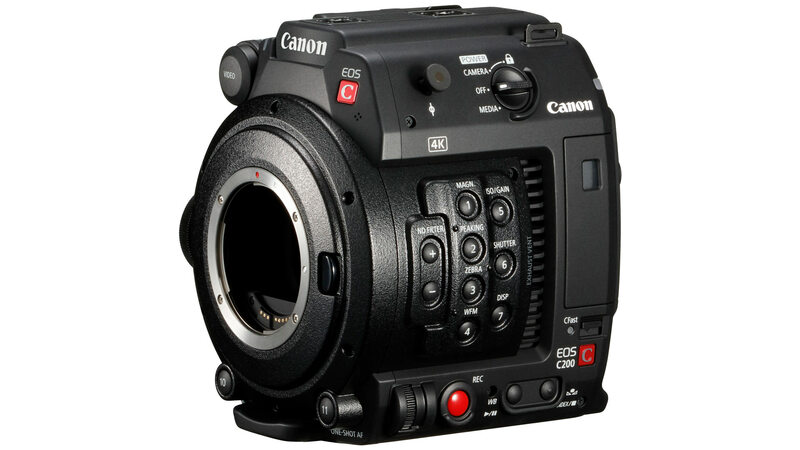 Or that it doesn’t want to alienate existing C300 II users with the introduction of a better C200. The C300 is tailored to broadcast specification, as demanded by the BBC and some (but not all) broadcasters around the world. For the Netherlands, it is only a requirement for films or TV series, not news or other programming. Canon, have you ever done actual research in this market segment? If you had, you would have learned that form factor and build-quality are far bigger concerns than the choice of codec (which, really, is a given). ENG camera crews want and need shoulder-mountable cameras that are built like tanks, so they can take the daily abuse of different teams. This is why broadcasters favor a Sony F5 over an FS7. Owner-operators, such as myself, are comfortable with a non-metal shell over their camera bodies. We take pride in and take care of our equipment. 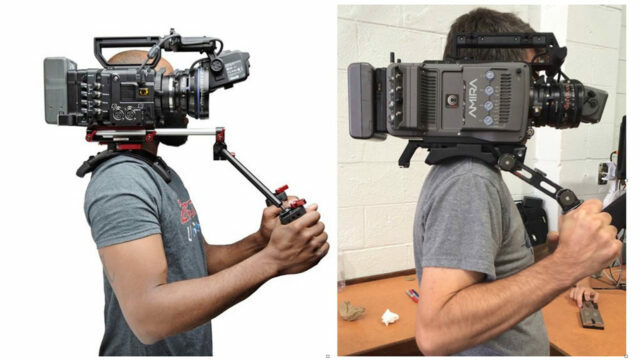 Nonetheless, many of my colleagues still like to rig up their 1.5kg camera into a full shoulder mount system with substantially more mass that sits comfortably on the side of their body. If you would create a C300 III/C400 system that requires less extra rigging and a sturdier body, you would really cater to this market. At a premium price. Like ARRI did with the Amira, Panasonic with the Varicam LT and Sony with the F5. Codecs are not the only deciding factor for broadcast, so it’s just plain silly to think that others will buy a camera that was not intended for them in the first place instead. Given that your own fears of cannibalizing apparently drive your business decisions more than actual user demand, why not come up with a system of paid upgrades? 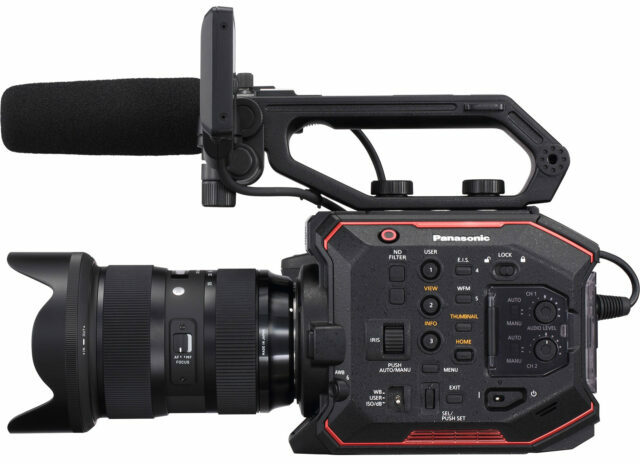 Sony has given users the ability to record raw externally on the entry-level FS5 and soon Panasonic will do the same with the EVA1. Don’t tell us what you cannot (read: will not) do – just make it happen. If I am assured that a reasonably-priced upgrade to 10-bit 4:2:2 in 4K is coming soon to the C200, I will not hesitate to invest. As things stand now, I have to deal with decisions I really do not want to deal with. As a loyal customer, I deserve your appreciation, Canon. If I really just did not care, I would not be taking the time to write this up. Conclusion: The math doesn’t lie. I realize that this article may read as old news to some. The issue has been covered a number of times as well in articles on cinema5D: here, here and here. Shortly following the introduction of the C200, the community shouted 10-bit 4:2:2 in 4K in unison as well. 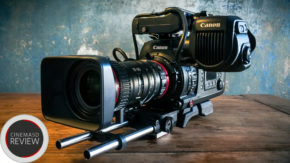 In fact, a petition titled Canon C200 do it right circulated the web in July of 2017 (now closed for voting) to little or no avail as of yet, although Tim Smith’s recent comment (“We should have it”) does spring some hope for the future. In all honesty, did you *really* sell an extra 600 units of end-of-life C300 IIs in the last six months as a result of your clever market segmentation strategy? I highly doubt that. Chances are growing that the Panasonic EVA1 will indeed take what could have been yours. And once you have bought into a certain brand, adapted your post workflow in terms of grading, you don’t switch lightly. Back in 2009, a similar massive request for manual aperture on the 5D Mark II came along – and its unexpected success lead to the creation of the EOS Cinema line-up in 2011. You listened and we rewarded you with our business, dear Canon. If only you would listen again to your loyal user base instead of your ‘clever’ engineers or marketeers – and act accordingly. 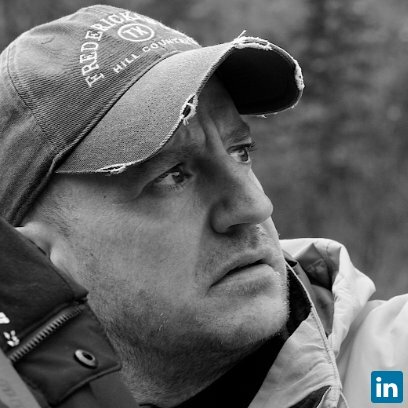 Richard van den Boogaard is a freelance filmmaker & editor based in the Netherlands. 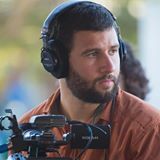 After 12-years in media, marketing & consultancy, he switched careers in 2009 and has embraced cinematic online filmmaking for a wide array of brands. Amen. I love my C200, but would definitely be willing to pay for 10-bit 4:2:2. +4 I speak for my studio. So you’re cheerleading for being nickle-and-dimed for things that the camera should have out of the box. Canon has a long history of peddling outdated junk years after it has long since become pathetic. They were trying to sell interlaced cameras long after Panasonic brought 24p to consumers. Their product line is way out in the weeds, and Canon needs a management housecleaning. How do they even survive with such cluelessness at the helm? 100% agree.. Spent months trying to decide on a camera and it all came down to the lack of 10-bit 422. 2018 c’mon..